Glasgow: China's Lin Dan and Malaysian Lee Chong Wei are both in the twilight of their careers, but they remain among the leading lights at this week’s World Championships in Glasgow. Dan, 34 in October, is a five time champion, and recognised as perhaps the greatest player of all time. So can he make it number six? "There are very many young players coming through, so it is a massive challenge," admitted Dan, the seventh seed. "I would be delighted to win again, but there is a lot of hard work to be done. There are a lot of hard players in the draw." Lee, who will turn 35 in October, is on a golden mission after being the best man and never the bridegroom too often — he has won three World Championship silver medals and three Olympic silvers. 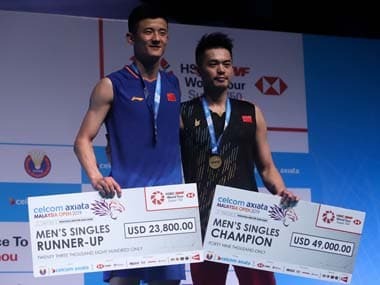 "I am very focussed, but it is going to be very hard," said Lee, who showed he is still a force to be reckoned with by winning his fourth All-England title this season. "At the Olympics, three are only two Chinese players, but here there are many more. The draw is very tough but I am going to do my best." So will this be the last World Championship for Lin and Lee? With a knowing smile, they replied in unison -- "I don’t know." On the woman's side Carolina Marin is seeking to add a third world crown to her burgeoning medals cabinet. The 24-year-old added to her lustre by winning Olympic gold in Rio last year although she sets little store in the past. "But this week I am forgetting about the past,” said Marin, who has slipped to fourth in the world rankings. "This is a new championship." "But my goal this week is to fight for the gold medal. "My expectations are very high. I have had two great months of preparation and feel even better than at the Olympics." India's fourth seed Pusarla Sindhu (known as PV) is bent on revenge having been beaten by Marin in the Olympic final and with two bronze medals in the worlds, in 2013 and 2014, she feels it is time to move up to the top step of the podium. "I hope I do well this week and I want a change of colour," she said with a smile. "I want better than bronze." Kirsty Gilmour, the No 16 seed, is the local Scottish hope and a valid outsider for a medal having taken on a new coach. "I am in great shape," said the 23-year-old who underwent a knee operation after last year’s Olympics. Gilmour believes new coach Malaysian Wong Tat Men has transformed her as a player and turned her into a viable contender for a medal. "He has been great," she said. "Everything has improved since last year and I am so excited to be playing in front of my home crowd. It is a privilege to be under pressure."